Activity Printer and newspaper owner/editor. Printer at Stafford, (1794); bookseller with circulating library, etc. Founded the Staffordshire Advertiser (1795). Supported Sheridan and the Whigs. Founded the Bookworm (b & d 1820), The Weekly Register of General Information (1827-8). Succeeded in printing business by sons John and William. Relationships Son of Joshua Drewry, printer at Lincoln, nephew (and apprentice) of John Drewry, printer and newspaper owner of Derby. Married, several children. "Joshua Drewrey, of Stafford, printer, & Sarah Wilson, lic. 26 Jan 1795"
Did Sarah die the following year? On the right is a link to the sonnet "Inscribed to the Memory of the late Mrs. Drewry", written by the Rev. William Ward who had been an apprentice to Joshua's uncle John Drewry. "William Ward had published a political manifesto in Derby .. so he was in great danger. 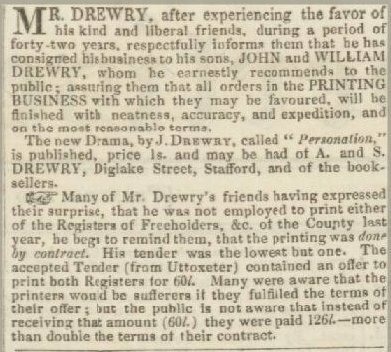 The Drewrys [see John Drewry] sent him to Stafford to start a newspaper there with Joshua Drewry. 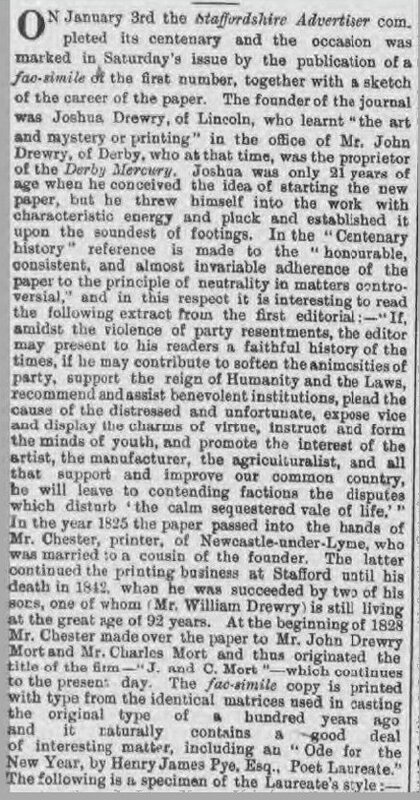 As an experienced editor it would have been William Ward's role to provide the expertise, but the extraordinary thing is that in the Local Studies Library in Stafford there is absolutely no record of his ever having anything to do with the newspaper ... only Joshua Drewry. 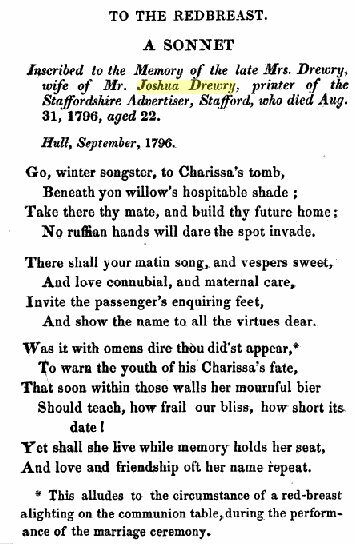 'The Monthly Magazine' records the death of "Mrs. Drewry, Wife of J. D. of Stafford" aged 22, in Derbyshire, September, 1796. 'The Gentleman's Magazine' and a number of other journals record the death in June 1796: "After a short indisposition, Mrs. Drewry, Wife of Mr. D. printer of the Derby Mercury". And the Register of Mickleover, Derbyshire: 29 May, 1796, Mrs Drewry (Derby), Childbed. 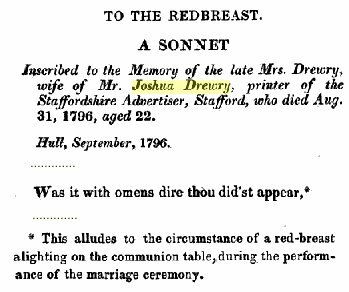 However, Joshua must have remarried at least once and perhaps twice given the death of Mrs Drewry in 1798. In the 1841 Census in St. Mary's, Stafford? 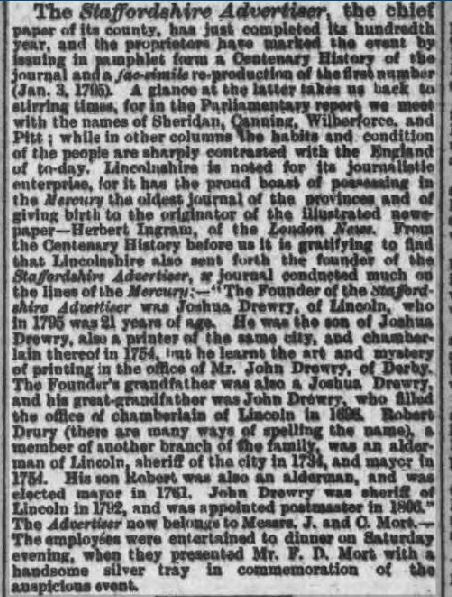 In the Derby Mercury in 1801 Joseph Drewry of Staffs. is shown as an agent for the Phoenix Fire Co., Derby. In 1818 The Manchester Mercury reported Joshua Drewry's appointment as Mayor of Stafford. "On Sunday, at the residence of his daughter, East Cottage, aged 68, Joshua Drewry, Gent. 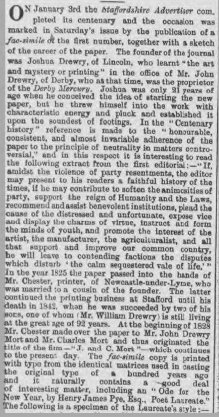 of Stafford, original proprietor of the 'Staffordshire Advertiser'"
From the Hereford Journal, 1841, describing Joshua as possibly "the father of the English Provincial Press"
In "The Newspaper press, in part of the last century and up to the present period of 1860"
"The officers of the Central Staffordshire Regiment of Local Militia, are particularly requested to meet at the Mess-room on Thursday, the 23rd of December instant, at 12 o'clock at noon, for the purpose of taking into consideration the expediency of volunteering their services, under the provisions of the Act of Parliament recently passed, to enable His Majesty to accept the services of the Local Militia out of their respective counties. Head Quarters, Stafford, Dec. Hth, 1813. Captain Amphlett, C. S.L.M., Stafford." Parties: John Hutchinson of the Close of Lincoln gent. and Henry Boot of the city of Lincoln surgeon. Mr Drewry is handing over to his sons John & William. 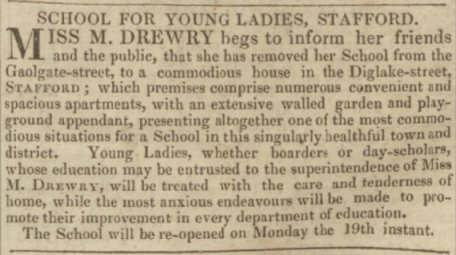 A daughter of Joshua Drewry died 13th January 1848. Article in Derby Mercury 9th January, 1895. 1825 - passed on to Charles Chester, husband of his cousin Ann Drewry. 1828 - passed to John Drewry Mort and Charles Chester Mort - both sons of Joshua's cousin Sophia, and her husband John Mort. John Drewry Mort and Charles Chester Mort formed a company to run the Advertiser and their printing business as 'J & C Mort'. George Drewry Mort, Married 1871 Mary Austin in Fenton, Staffs. George's date of birth is given as 1837 and his father as John Drury Mort. Article in The Stamford Mercury, 1895. 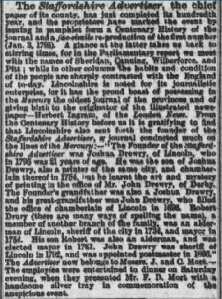 'The founder of the Staffordshire Advertiser was Joshua Drewry, of Lincoln, who in 1795 was 21 years of age. He was the son of Joshua Drewry, also a printer of the same city, and chamberlain thereof in 1754, but he learnt the art and mystery of printing in the office of [his uncle] Mr. John Drewry, of Derby. The Founder's grandfather was also a Joshua Drewry, and his great-grandfather was John Drewry, who filled the office of chamberlain of Lincoln in 1695. Robert Drury (there are many ways of spelling the name), a member of another branch of the family, was an alderman of Lincoln, sheriff of the city in 1734 and mayor in 1754. His son Robert was also an alderman and was elected mayor. The Advertiser now belongs to Messrs. J. and C. Mort .."
The Stamford Mercury still exists as the Rutland and Stamford Mercury, based in Stamford, Lincolnshire. It claims to be 'Britain's oldest newspaper', with a masthead proclaiming that it has been published since 1695. Which of the Joshuas took Thomas Sherwin as an apprentice in 1796?